do you mean like the black and white masks ...like the ones psp uses . i have been at this for four hours and i am still no nearer to applying a mask as we know it. the masks i can get to work are more ar less a clipping to an image. maybe someone els can show us. I don't know if this is what you are looking for or not. I made a frame, very basic, and just used black. Saved as a png without the background. Placed it on my photo and I did have to clip it, but I used the erase blend mode. It's not quite like a mask in PSP, but it worked. Oh dear, sorry you didn't have much success Teejay. Not sure if it can be done. Yes, the masking we used to do in PSP....sort of transparent edges. I'll give it a go over next couple of days see if I have more luck. Linda, that's one way of doing it but what I have in mind is where the edges are fade to transparency. Yours result is lovely by the way. I too would love to learn how to use a mask in AD in the way we did it in PI and PSP. I have close to 200 masks and used them a LOT prior to AD. I miss that ability. I did try a few things but couldn't find a way to do it. Below is what I would like to achieve using a mask. In PI, it's a simple thing.. just drag the mask over the image, convert to object, and you're done. So, any ideas on how to do this in AD? I've started to look into it also, but so far not really to mention. It was very easy in PI and I also have lots and lots of masks. Something like these? I don't know if they are what you are looking for, but I've had a lot of fun working on it!! The original mask conversation started in Sheryl's thread for safely searching Google. Linda, I have merged the topics so it's all in one place. I think I know what I did wrong when I tried it so going to give it another go. Be back soon!! The first one is what type of results I'm looking for. I have a mask and an image. I put the image into the mask with no luck , then I put the mask into the image - no luck. Also used Erase both times but must be missing something. Below are my image and my mask. I was taught when making a mask that black blocks. So your mask to me is backwards. I created a black square and then put your mask on it and used the erase blend mode. I exported it as a png without the background. Now it's a new mask. 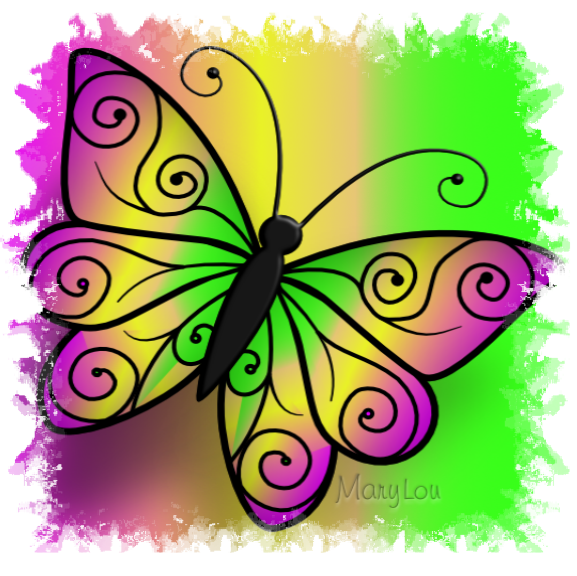 Then I tested it by placing it on the butterfly and used the erase blend mode again. That gives the look you were after. So it's not a true mask I guess, but it works like the frames did in PSP. I've got it going now!! In PI, i have to drag a mask out onto the workspace, then use the magic wand to select all the white areas. Right-click and invert, then save as .png to make the mask. Place both image and mask in AD with the mask on the top layer. Position the image under the mask. On the mask level, set the mode to Erase. Works perfect every time!! I went to look for my PI masks and they were all gone! Must have deleted thinking I would't be able to use them again. Luckily, I found them on a 2015 backup! So now, I have at least 150 of them.. maybe more! Looks like I'm going to have a lot of new things to play with!! Thanks for the help, Linda! Oh, I had to save it as image WITH background, otherwise the black edge showed. It was the new mask that I was exporting without a background. When I apply it to an image and export, I found that you have to clip it inside your photo OR you have to group the 2 layers. I tried it both ways and exported without a background and then there is no black showing. Glad you figured out a way to do it! The image you posted shows a white border around the edges rather than being invisible. I just tried again... I THINK I might have it right this time!! I think I did it the way I want it!!! Was super simple. Now I just need to dig a bunch of masks out of PI. Here is also my layers so those who want to try it can. Ahh, I didn't notice that when I posted it and it didn't show on my screen in Ad. Glad you got it figured out MaryLou!